note: i cut this recipe in half and only used one chicken. it would easily serve 2-4 depending on hunger, and dark meat eaters. 1. for the chicken: whisk water, vinegar, and salt in large bowl until salt dissolves. add chicken and refrigerate, covered, for 1 to 2 hours. 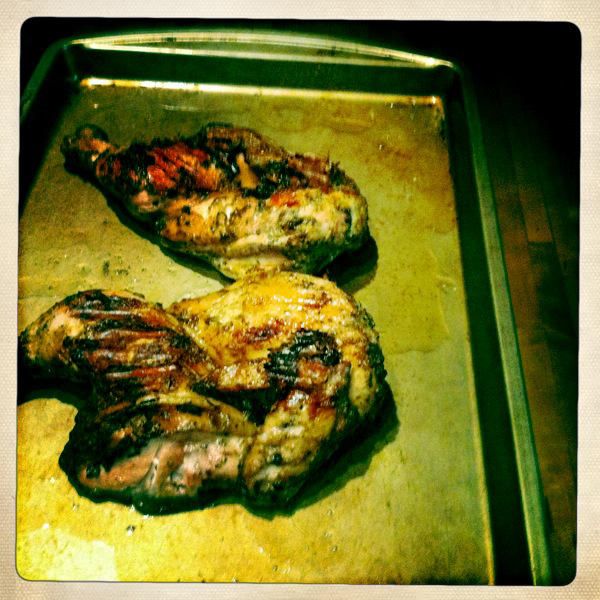 do not brine the chicken longer than 2 hours or the vinegar will make the meat mushy. 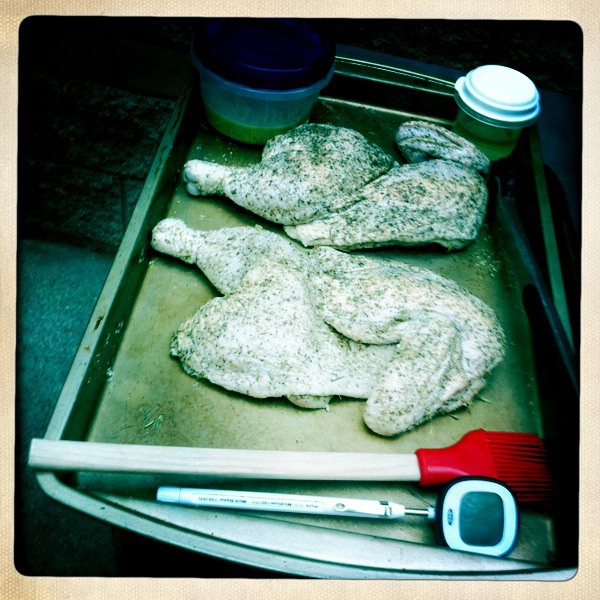 2. for the seasoning and sauce: combine poultry seasoning, 2 tsp salt, and 2 tsp pepper in a small bowl; set aside. 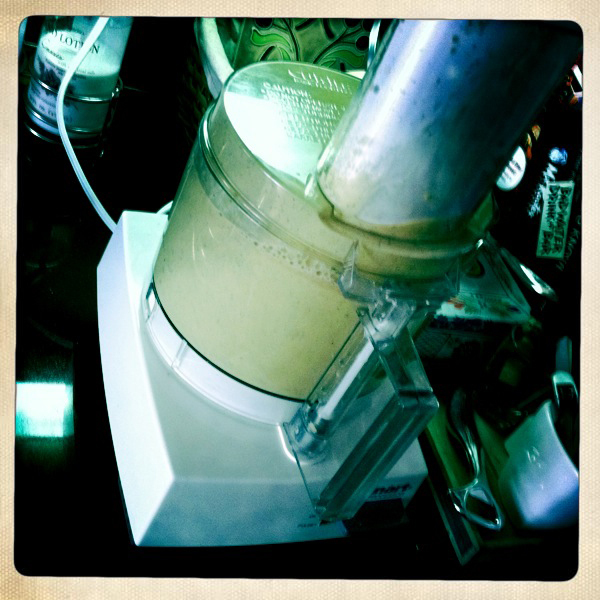 process vinegar, mustard, sage, rosemary, 1/2 tsp salt, and 1/2 tsp pepper in a blender until smooth, about 1 minute. with blender running, slowly add oil until incorporated. transfer vinegar sauce to a small bowl and reserve for basting chicken in step 4. 3. heat all grill burners on high for 15 minutes, then turn all burners to medium-low. (for charcoal grill, light 75 coals; when covered with fine gray ash, spread evenly over bottom of grill. set cooking grate in plate and heat covered, with lid vents open completely, for 5 minutes.) scrape and oil cooking grate. 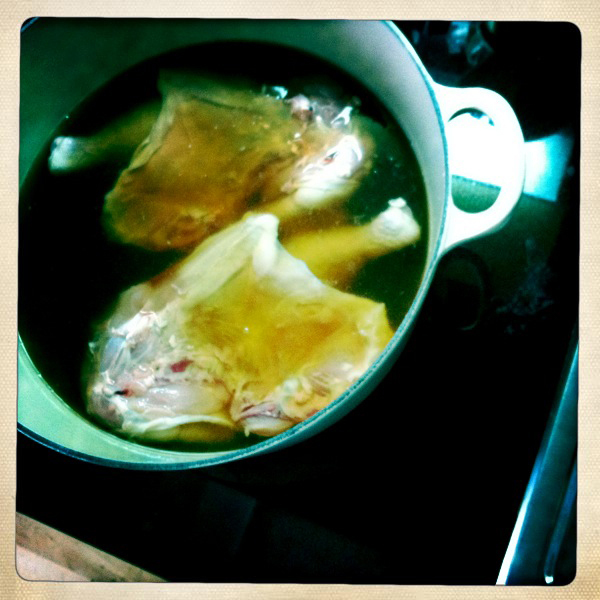 4. remove chicken from brine. pat dry with paper towels and rub all over with poultry seasoning mixture. arrange chicken skin side up on grill and baste with vinegar sauce. grill, covered, until chicken is well browned on bottom and meat registers 120 degrees, 25-30 minutes, basting with sauce halfway through cooking. 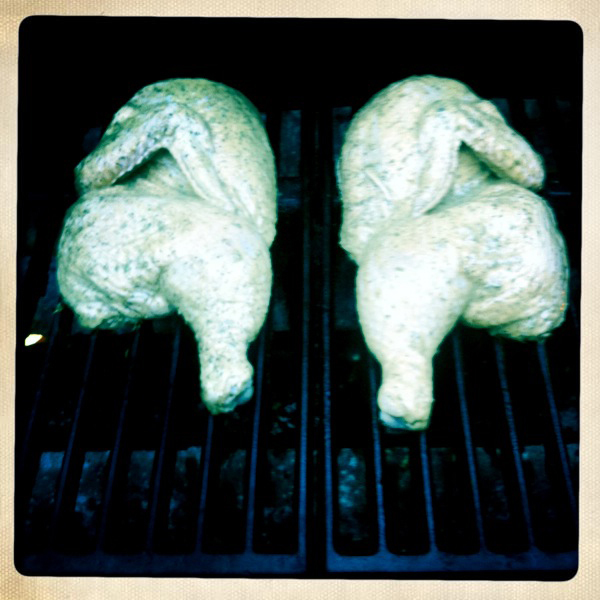 baste the chicken carefully, as any excess will drip onto the fire and flare up. also, depending on your grill, times will vary. mine is fairly hot even on low, and reached optimum temperatures quicker. flip chicken skin side down and baste with sauce. continue to grill, covered, until skin is golden brown and crisp and thigh meat registers 170 to 175 degrees, 20 to 25 minutes longer. transfer chicken to platter (do not cover) and let rest 5 minutes. cut into pieces and serve. honestly the picture doesn’t do the final product justice. it is simply a really easy way to make grilled chicken that results in crispy skin, with tangy, flavorful, and extremely moist meat.